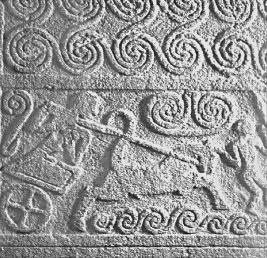 In micenaean Greece (XIV - XI sec. a.C.) various types of writing existed, probably also for various languages other then the Greek, as the Disc of Phaistos testifies. First of all hierogliphic writings,like Egyptian or today's Chinese:one word / idea = one sign. 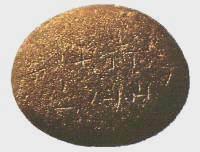 Of this type of writing (recorded mostly on clay tablets) little elements exist and what remains is still to be deciphered. Then there are tablets in syllabic writing (that is: one syllable = one sign) called Linear A, used, but not exclusively, during the cretan thalassocracy until the mycenaean take-over of 1450 b.C.. Documents are more numerous of that hierogliphic, but still not sufficient in order to begin a statistical search and therefore to understand meaning. Only the system of notation of numbers (decimal) is known,and is similar to that one of the Linear B writing. In receent times an interpretation has been proposed, giving to some signs of Linear A the same meaning as it appears in the Linear B texts: the language of Linear A would have many similarities with Hurrian, attesting on this way the use in Crete, in Greece and also in the Middle East (cf. 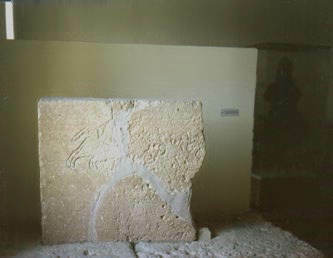 Lachish) of an administrative Language, different from the spoken language and also, probably, demonstrating the presence, during a long time, of populations from the Near East in the Aegean (maybe just the Eteocreteans in the oriental part of Crete, still in historical times ). Up to now other applications of this writing, have not been found, but it is also probable that if they were (as an example : historical literature or news) these were written on perishable material, therefore destroyed by time.And this is a damage also for the same historical analysis: we know of this culture the names of shepherds, of craftsmen, also of animals (always recorded and counted on the tablets),but it is impossible to find a single name of a king or "wanax", nothing from which we are able to gain references and to relate , as an example, the history of Greece of those centuries to the panorama of the history of Middle-east and Mediterranean Sea. If we look at the biographies Near East peoples carved on mountain walls or wrapping entire statues, this lack of the micenaean culture could perhaps make us think of " religious prohibitions ". 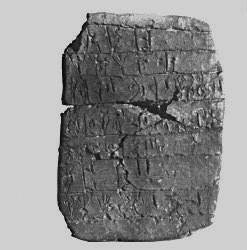 This is the most ancient document in Linear B.Found in Kafkania (Olimpia) recently, for the context in which has been discovered, it seems to go back to XV century b.C. 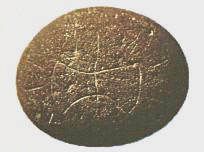 and that could testify not only the presence of Greek populations already stablily settled in the Peloponnese in that age , but aòso the high degree of their culture .The pebble has, recorded on a face, the word KA-RO-QO:probably the genitive of belonging of a name of man Charops, which occurs also in the homeric poetry. Why did the Lions ..
A Goddess in mycenaean ..